The 12 Inch Rigid Miter Saw features Blade Depth Adjustment, which enables drabbet cut. The powerful motor moves swiftly through difficult cuts. It has a nice dust collection system, which helps you to keep the work area tidy. Quick release miter locks makes for swifter angle adjustments. A work clamp fitted with a fast-release lever holds the material tightly. Repeat-A-Cut marking allows fence marks for repetitive cuts. An expanded table provides increased material support for the capacity of a sliding miter saw. Heavy equipment with the Dust collection system not designed properly. Larger blades do cost more money. 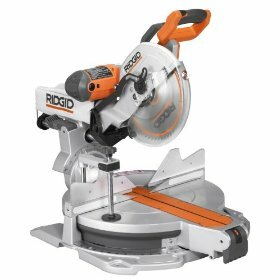 The 12-Inch Rigid Miter Saw is a great woodworking tool. It is very rigid and can cut efficiently and precisely. I have been using saws for quite some time now and have been testing saws of different types. A good saw is one that has negligible deflection on the sides and the Rigid Miter Saw is a perfect fit under that category. The cheap miter saws that are available in the market are very flimsy and the sliders are also very flexible which makes operation difficult. But this is a really tight miter saw. People who generally use the sizes of 2x6 and 4x4 would really love this miter saw. It should be given a 5-star rating on that front although it has a fence that needs some filing on the back for squaring of the upper extension. The nice transport handle provides for fine angle markings and a solid design. The Laser provided with the equipment is one of the best in its category. Although, it shifts to the left slightly on use, yet is quite useful. It gives you an accurate idea of where the incision would be made. Everything seems firm and real solid with this miter saw. The 12-Inch Rigid Miter Saw large work table makes for ample space although the dust collection system leaves much to be desired. The miter range and the dual bevel range is suitable for most purposes. The nicely written operator's manual depicts the instructions neatly along with diagrams for novices. All in all, a good tool that can be considered for keeping in any woodworker's tool box! Return From 12 Inch Rigid Miter Saw Page to Home.